I was itching to get a winter outing on the Cascades Mountaineers schedule. Something that would be accessible for people who wanted to practice their snow travel skills. 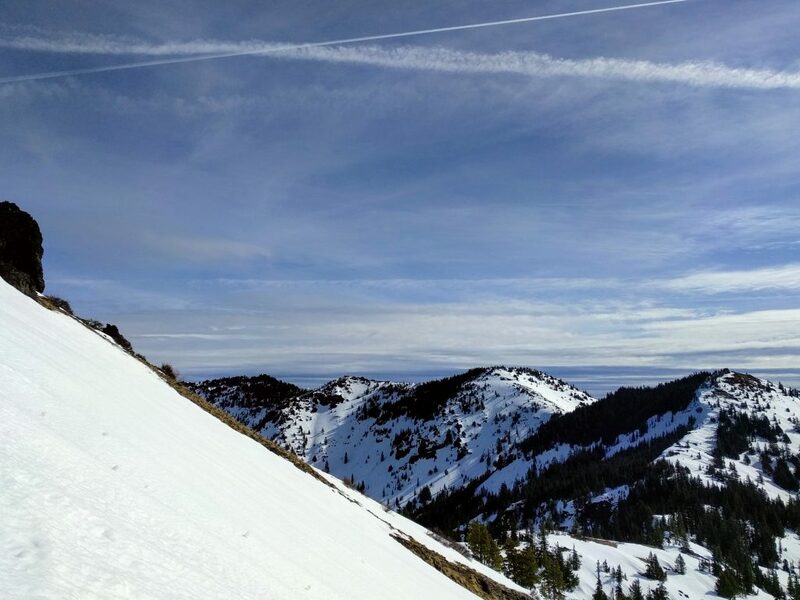 Having done this type of event on Cone Peak before, it was the natural choice. I had three people show up at the appointed time so off we went. It was already warm and sunny at 9 am. We immediately put our snowshoes on to help us walk across the deep, wet snow. I fell into a rhythm as I hiked this familiar trail through the woods to the first open meadow. From there we were treated to views of beautiful cloud formations and our conical destination. We found the path of least resistance through the trees at the far end of the meadows and began going uphill. Partway up we swapped our snowshoes and poles for crampons and ice ax since that was the whole point of the trip. 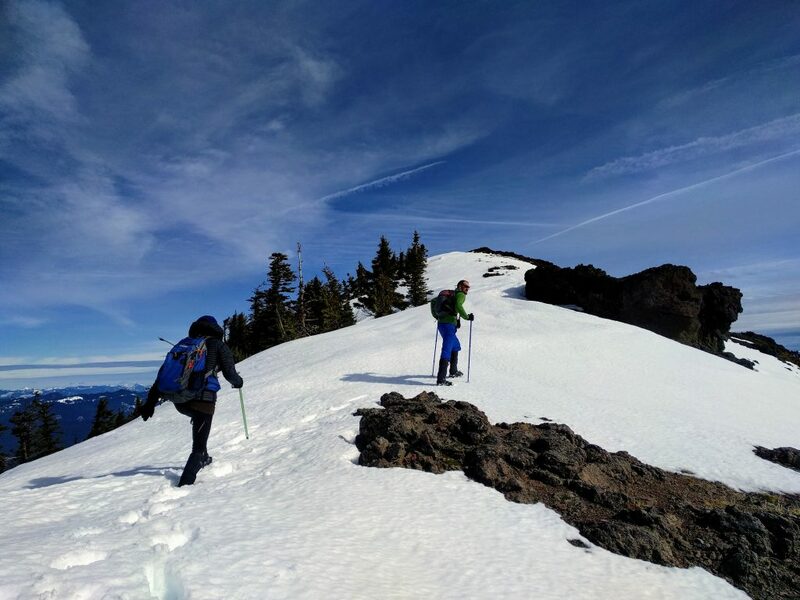 Everyone got a chance to practice fiddling with gear and walking up steep snow. One of the participants was nervous about the snow so she kept veering towards a rock rib to our left. I yelled at her to come back and face that snow slope head on. She complied and got a great lesson in trusting her feet in the snow. Up and up we went. Once we hit the ridge we strolled happily to the highpoint on the far end. It was windy up there, so we hung out long enough to snap a picture and then doubled back to hide in the lee of a small rock outcrop to eat lunch. 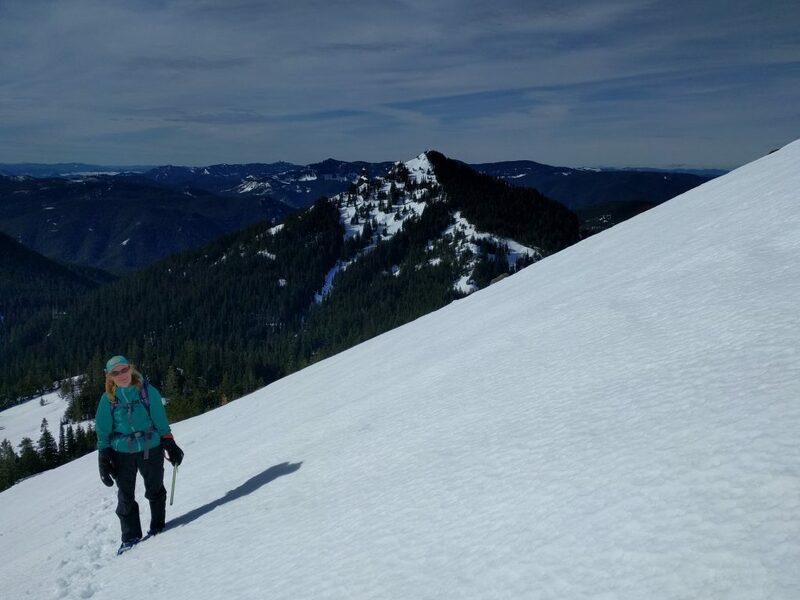 The return hike provided an opportunity to practice downclimbing a steep, wet snowslope, which presented different challenges than going up. Once we got through the worst of it, we changed back into snowshoes and followed our tracks back out to the trail head. Snow conditions are different from day to day and it never hurts to get more experience practicing snow travel. The more time I spend on snow the more I am able to anticipate what I’m in for and adjust my behavior to match the conditions. I can only hope that my group members gained a little more insight and experience so that the next time they get out they feel better prepared! 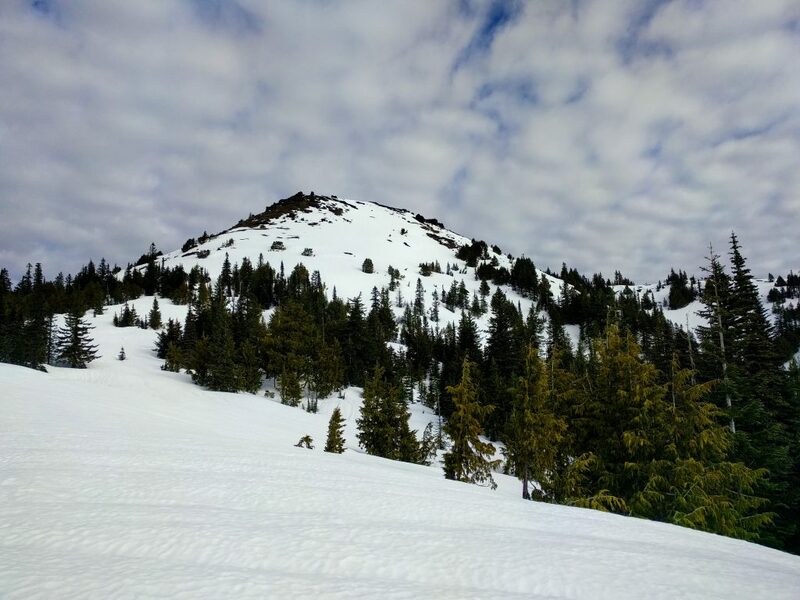 This entry was posted in Hiking, Oregon and tagged hike366 on March 13, 2017 by Jess B.